In contrast to a high rope course, visitors don't have to be belayed in a low rope course. The elements and podiums are mounted in a safe jumping height between 30 - 100 cm above the ground. The elements can be built for teambuilding, playing or therapeutic climbing. This makes the rope course a universally usable facility. The Adventure Trail is a low rope course for playing. Multiple balance and climbing elements are combined into a course, offering variety compared to conventional playground equipment. The trail can be equipped with all kinds of elements, like climbing elements from our high rope courses. The adventurous playground equipment combines a lot of different ways of movement to a continuous course. Children can play on every element separately or they can practice gymnastics through the whole course. The Adventure Trail is a modular climbing and playing system. It fits different needs very flexible. The possible combinations of elements are almost infinite. The low ropes course provides space for a lot of children at the same time. Therefore it is a perfect solution for schoolyards and outdoor areas of preschools and kindergartens. But also public playgrounds and parks profit from its natural look. 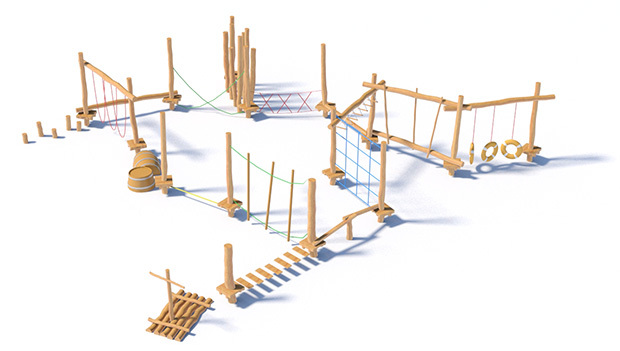 Classic rope course elements like wobble bridge, balance beam and nets can be combined with other typical playground equipment like slides and towers. The Adventure Trail not only fascinates, but also has positive impact on children’s development. Especially motivity, posture and self-evaluation are trained. Even social behavior improves while playing with other children.